SYDNEY THE HARBOUR CAPITAL: The Harbour Bridge and the serrated sails of the Opera House are twin symbols of Sydney the place where European settlement in Australia commenced in 1788. One of the harbour's most dramatic moments is the annual Australia Day ( 26 January ) Ferry Race, when the city's commuter ferry fleet churns its way past the city shoreline. Darling Harbour is a recent harbourside development of hotels, shopping arcades and dramatic glass architecture, all clustered around a horseshoe bay. For many visitors, Sydney is synonymous with Australia and is its unofficial " capital ". Around 20 per cent the continent's population lives in this relaxed city of over 3.5 million people. Not far from the centre of the city, Darling Harbour has restaurants, boutiquse and bars, plus more substantial institutions like the National Maritime Museum and the Chinese Garden, an oasis of waterfalls and classic oriental landscaping. The easiest way to reach Darling Harbour from the city is to catch the monorail across Pyrmont Bridge. Nearby is the Sydney Aquarium with its exciting display of the major marine dwellers found in Australian waters. SYDNEY SIGHTS : Sydney's founders had the good sense to preserve generous slices of park land. 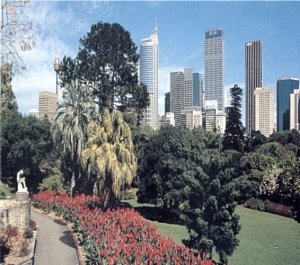 The beautiful Royal Botanic Gardens is an oasis encompassing some 30 hectares of ponds and Australian and imported flora. Kings Cross can be a lively place, with street cafes, quality restaurants and all - night bars. circular Quay has been the heart of the Sydney since 1788 when Captain Arthur Phillip first founded the colony of New South Wales. GOLDEN BEACHES : Bronzed lifesavers are among the more famous performers at Bondi Beach, Australia's most celebrated stretch of sand and exertions. As a beach for all seasons, Bondi is a favourite place for the dwellers of Sydney's eastern suburbs, whether they are surfing, eating at one of the many cafes or just ambling on the kilometre-long Espalande. 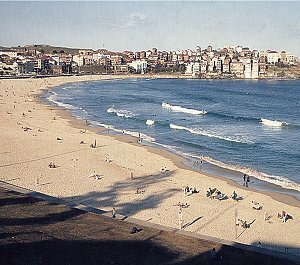 Coogee Beach, south of Bondi, is partially protected from surf by Wedding Cake Island, while its wide sands lead to saltwater pools at the south-ern and of the beach. Manly, to the north of the city, has both ocean and harbour beaches, plus its own oceanarium. MOUNTAINS, SEAS AND PLAINS : The Blue Mountains, 100 kilometres west of Sydney, are part of an ancient, eroded sand-stone plateau that shelters deep valleys and forest wilderness. 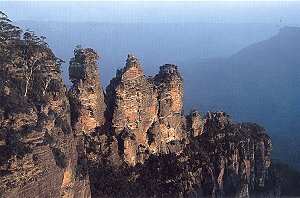 The most famous view overlooks the Three Sisters pinnacles and into the Jamison Valley. On the coast, south of Sydney is the Kiama Blowhole where spray jetting from a rocky headland can rise up to 30 meters. Inland, Gloucester is famed for thoroughbred horses and rural views. NORTH TO THE SUN : Coffs Harbour, midway between Sydney and Brisbane, is a good stopover point on any Pacific Highway adventure. 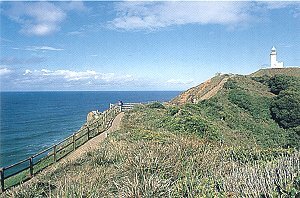 Coffs Harbour has plenty of outdoor activities, like fishing, surfing, whitewater rafting on the nearby Nymboida River, four-wheel drive forest tours, golf and fishing, and good accommodation. Ballina is at the southern tip of a 'surf city' beach strip that runs all the way up past the Queensland border; at the mouth of the Richmond River, it too has very good fishing. Thirty kilometres further north, Byron Bay (with its famed lighthouse) has breathtaking scenery and is the most easterly, is magnificent setting has become a mecca for the fashionable and hedonistic.